The discribtion is for both loges the same. They are the same type of loges. Our cosy log cabin “Haus Amsel” is situated in a small holiday home area surrounded by woods and meadows, in the outskirts of the village Bodstedt and close to the nature reserve “Vorpommersche Boddenlandschaft. This bucolic place with the mild costal climate is ideal for holidays away from the hurly-burly of the seaside resorts. Spent your holidays in our lovingly furnished “Haus Amsel”. The property consists of 510 m² and the living space is 110 m². 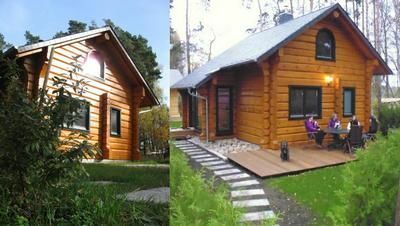 In our in 2014 finished log cabin you will find a fully equipped kitchen, a living room including a lovely fireside, two bathrooms and 3 bedrooms for 7 persons. Baby crib and highchair for the youngest are available on site. On the sunny terrace you can relax, watch the sunset, observe birds and game or spent the evening having a nice barbecue. Therefore you will find garden chairs with variable backs as well as a grill. Please respect, that this is a non-smoking house. Pets are welcome in this house. A friendly host is a matter of course. The contact person on site is Wolli the owner of café & bar Wolli. He will take care of you, if you have any problems or questions. The holiday home area consists of 28 holiday homes and the café & bar Wolli. Only few cars drive through this area, so the children can run around almost without supervision. Often they form new friendships, while they play with other children. The properties are big enough so you can also adjourn to the garden and just relax. The cycling track called “Östlicher-Backstein-Rundweg”, which goes all the way around the bay starts just in front of the holiday home area. It is 80 km / 50 mi long, so you can cycle it on only one day. It takes you just 30 minutes by bike to the beautiful beach in Zingst. The cycling track is also suitable for rollerblades and skateboards. It is also recommendable to go for a run or do nordic-walking. The Wolli is a nice little café at the entrance of the holiday home area. During the afternoons you can get coffee, homemade cakes and ice-cream. The homemade potato soup with scrimps is also very recommendable. In the evening you can enjoy the sunset, while drinking a beer, a wine, or you try one of the many different kinds of whiskey. Bodstedt: Especially the little port with the traditional wooden fishing boats the “Zeesenboote” is interesting to see. Every year at the first weekend in September the oldest regatta of those Zeesenboote takes place in the bay of Bodstedt. From the pier you can do tours by boat around the bay or take a ferry to the Darß. It is possible to take your bike with you. It is only 3 minutes by bike to the beach. The shallow bay is ideal for children who cannot swim and waterenthusiasts. Adults can relax on the meadow next to the beach. In the village are 3 restaurants which offer the typical fish with fried potatoes. The local fisherman sells delicious fresh and smoked fish. Have fun while investigating and enjoying the surroundings by bike, by horse or by foot. Surroundings: You will enjoy your holidays in a quite spot. Not far away are the cities of Zingst (10 km / 6,2 mi) and Prerow (18 km / 11,2 mi). Zingst was formed by maritim traditions and the “Prerow Bay” is one of the most beautiful beaches in Europe. In Barth (7 km / 4,3 mi) are supermarkets, shopping facilities, restaurants and events in the evenings. The bay and the Baltic Sea are suitable for all kinds of water-activity; you will find lots of different offers. Hiking is IN: If youstrikenewpaths it will be worth it, especially in autumn, when thousands of cranes are there. Consumption of electricity must be payed (0,30 € / kWh). - Fuel for chimney/fireplace: once per object according to consumption (Mandatory). - Final cleaning: once per object Costs amounting to 120 EUR (optional). Bed linen (once per person, vorhanden 10 EUR). Final cleaning (once per object, Costs amounting to 120 EUR). Parking facilities (per property and day, included in price 0 EUR). Towels (once per person, vorhanden 5 EUR).